"Plush Addict was a happy accident and I have my gorgeous 2 year old girl to thank for my blossoming online fabric business. I had a successful career in London for a software company but quit in search of something more fulfilling and started to train to become an acupuncturist. My acupuncture college went bust three quarters of the way through my first year of study and I then found myself pregnant! The world of opportunities for a pregnant, unemployed woman in her late 30s were quite slim and so I filled my time researching, planning and sewing for our new arrival. I discovered the wonderful world of modern cloth nappies (they are a million miles away from the white terry towelling square your mum used, honest!). These days cloth nappies can be beautiful works of art and I wanted to try creating my own. 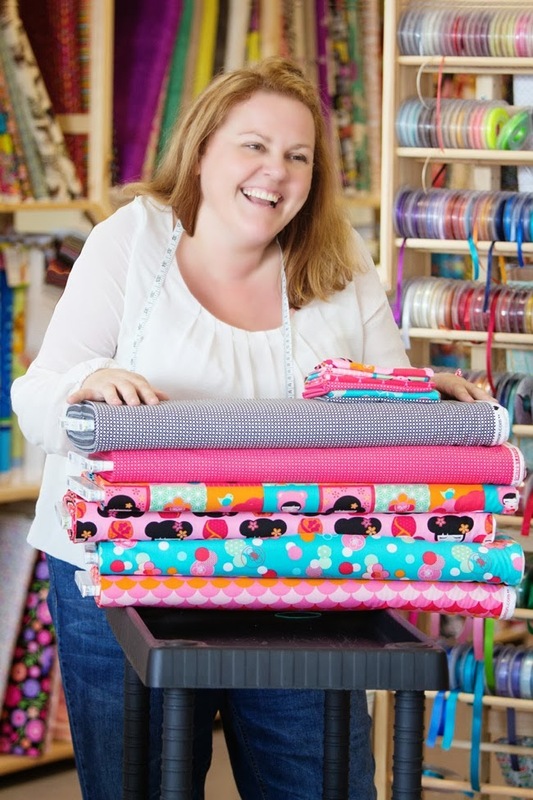 I was soon frustrated that you needed to shop in several different places (including the US) for the supplies you need so I decided to become a one stop shop for cloth nappy making supplies. The business took off from day one. 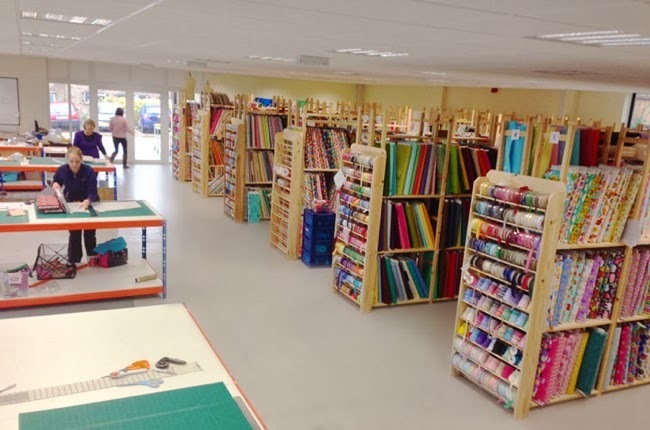 We have expanded our product lines really extensively and now have a very diverse range of haberdashery and fabrics from quilting cottons through to waterproof fabrics, which we sell online through our website to customers all over the world. I get up at 6.45am every morning. I’ve always believed that rising before the hour of 7am means I’m being sleep deprived and I thought running my own business would mean a later start to the day, alas I was very naive! 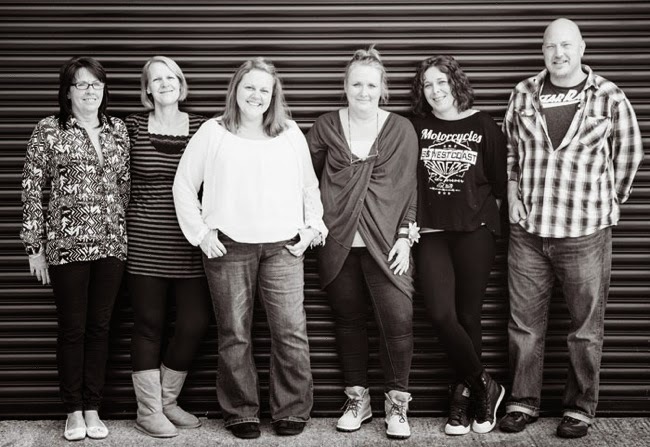 Mornings are always a bit of a rush to get us all washed, dressed and vertical but somehow we usually manage to cobble it all together and leave the house by about 7.45am and are at the warehouse by 8am. I usually start the day with a strong cup of coffee and catch up on my emails and messages though our Facebook and Twitter pages. Managing social media and marketing is something that I look after and first thing I put together are photo collages and blurb for our social media posts. Once that’s all geared up I’m often found running round the warehouse with a laptop and a trolley checking stock, changing photos, doing colour matches and answering customer questions and doing any general fiddling jobs that I’ve spotted need doing. After that my day can really go one of a few ways… Fabric buying is a big part of what I do and has to be pretty up there with one of *the* best parts of running Plush Addict. I’m the luckiest girl alive as the business gives me a completely legitimate reason to indulge my ridiculous fabric addiction. I know I’m not alone here when I say that fabric gives me a physical reaction when I see some I love, or when we get a delivery arrive my chest tightens, I get a bit flustered and I generally squeal high pitched and very loudly, something we’ve termed in house as a “Fabricgasm”! Often I’m placing orders for things that are months away from delivery, yesterday I was perusing Christmas fabrics for 2014 which is pretty bonkers seeing as the decorations aren’t even up for 2013 yet. Buying so far in advance means a bit of crystal ball gazing as to what might be popular in a couple of seasons time so I am a slave to Bloglovin for hints and inspiration. I try to keep the range as diverse and rich in choice as possible. Not everyone likes the same things and I do try to plan our purchasing considering all tastes and I don’t just shop with my fabric loves in mind (I love the camp, kitsch and weird Japanese stuff - not everyone’s cuppa!). We're striving to be a “one-stop shop” where you can buy all that you need for your project in one place as we know how annoying postage charges are so I’m always on the look out for the next thing to add. 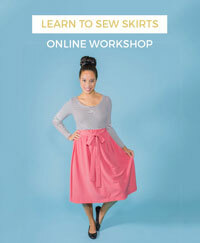 If I’m not fabric buying or researching then I’m probably found tinkering in Photoshop or writing a blog post. Recently I’ve had my head buried getting to grips with the Adobe Creative Suite which I have loved! It’s been a wonderful way to pamper my inner geek and be creative at the same time. It’s been a huge eye opener for me in to how fabric prints are designed and I have already started work on designing my first fabric. One of the more niche fabrics we stock is a waterproof fabric called PUL and we are hoping to launch our own range of PUL prints next year if all goes to plan (get me!). We have a brilliant team of lovely local ladies that all work very hard to get our customer orders out on the same day they are placed. I’ve got the family roped in too and my mum (nick named Nanny Plush), my sister-in-law and hubby are all on board these days. The team all stop for lunch together around 1pm and it’s about the only time of the day we get to sit down so everyone relishes it. Lunch choice is about the only thing I miss from my previous life working in London, I even have dreams about Pret! The downside of having a warehouse full of fabric means we are on an industrial estate. There is a sandwich van that comes to visit but it’s not quite the same. We do make up for it with good coffee though. And cake. Lots of cake. 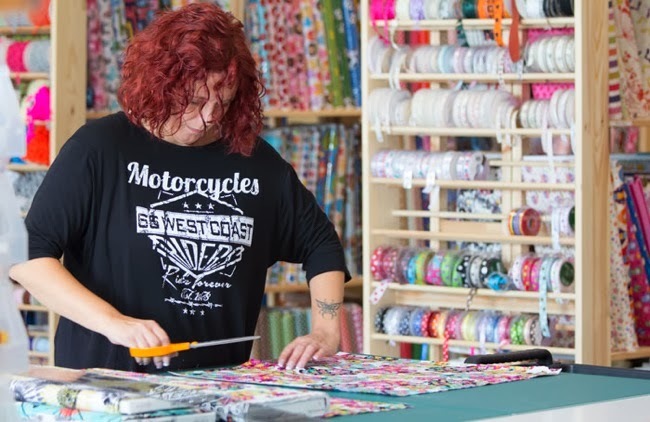 Since my husband Jon joined me full time in the business about a year ago, he now looks after the very important day to day operations that are needed to get all of our customer orders cut, packaged, checked and dispatched. We set ourselves tight targets for the speed we turn orders around in (who wants to wait for their fabric fix?!) and he’s way better at the practicalities than I am and actually thrives on the hustle which always stressed me out. It’s brilliant that we each get to play to our individual strengths and I do feel very privileged that we get to work together. The day gets pretty hectic around 4pm most days when we are trying to get all the orders in the post sacks before the postie comes at 5pm. We usually leave the warehouse around 5.30pm. When we get home and after we’ve eaten and our little lady is in bed Jon and I usually carry on working. 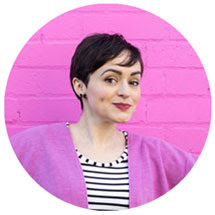 One thing about having your own business is that it’s very hard to switch it off and the evenings and weekends is when I’ll do most work on my blog writing tutorials or fabric guides. I do wish there was more time in the week for sewing but it does sadly seem to be the last task and gets squeezed in around everything else. We get way more time together as a family than either of our previous jobs would have allowed - on Thursdays Jon looks after our daughter and Fridays are my day off with her which is amazing. We both feel blessed that Plush Addict allows us this perk so evening and weekend working doesn’t feel like such a bum deal. 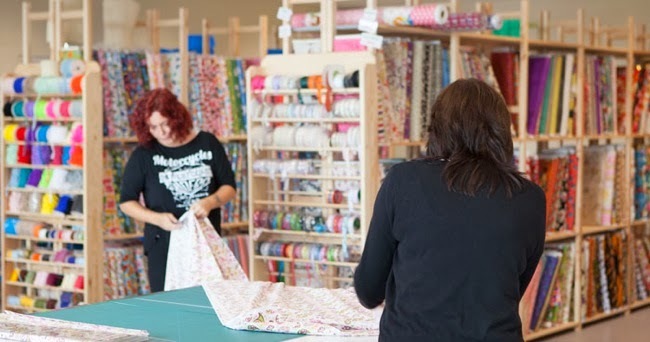 Next year we’re hoping to take the office space above the warehouse and set up sewing workshops and have a drop in social sewing space with big work tables and machines to use. I’ve been networking locally and have several very talented ladies interested in running classes and I hope to run some myself too (although that feels very scary!). There’s a lot more that goes on behind the scenes than you’d think and since starting Plush Addict my days have never been busier. I’ve never worked such long hours or been so consumed (and stressed!) by anything, but I wouldn’t change it for the world :)"
Aw... thank you for sharing your day with us, Kellie! Can I come over to play sometime? 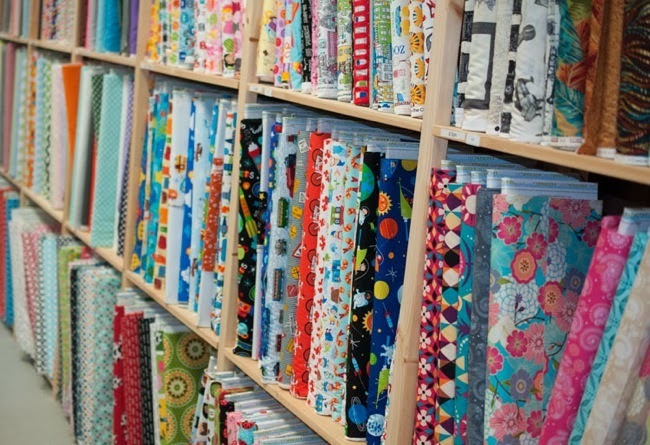 Readers, take a look at all the lovely fabrics that Plush Addict has on offer. I've got my eye on this flannel for some glow in the dark PJs - yes, glow in the dark! !